This is a story about loyalty, dedication and perseverance—the story of Hiroo Onoda. When he was a young man, he enlisted in the Japanese army to fight in World War II. He ended up fighting that war for 29 years long after it ended, purely because he did not know it was over. His faith was so strong that the Japanese could not lose, that he refused to surrender no matter how many times the local people and even his own countrymen begged. When he was just 20 years old, Hiroo Onoda was working in China at a trading company. When he received a summons to join the Japanese army, Onoda immediately quit his job and headed back to Japan for training. Due to his aptitude and the dedication he displayed at his basic military training, he was sent for specialized training at an Nakano school to become an intelligence officer. There he was specifically taught how to gather intelligence while waging guerilla warfare. This was a training that would make his perceived enemies around him miserable for near 30 years. "You are absolutely forbidden to die by your own hand. It may take three years, it may take five, but whatever happens, we’ll come back for you. Until then, so long as you have one soldier, you are to continue to lead him. You may have to live on coconuts. If that’s the case, live on coconuts! Under no circumstances are you [to] give up your life voluntarily." It was because of these orders and his loyalty to his country that Hiroo Onoda fought so hard for so long even in miserable circumstances. After landing on the island, he attempted to persuade the Japanese officers that were already stationed there to help destroy the harbor and the airfield to make enemy invasion more difficult. They refused and because of it shortly after Onoda's arrival in February 1945, Allied forces conquered the island. The remaining Japanese soldiers, Onoda included, headed off into the jungle in small cells of 4 or 5 soldiers. As one could imagine, jungle life was hard for those not trained in jungle survival and guerilla warfare. Most of the small cells were quickly wiped out from either skirmishes with occupying forces or the ever-present other dangers in the jungle. However, Onoda and his group consisting of Yuichi Akatsu, Kinshichi Kozuka, and Soichi Shimda were not. They, and a few other surviving cells, used guerilla warfare to harry occupying troops while strictly rationing food and ammo. They supplemented their diet with food from the jungle as well as what they snatched from local farms during raids. After another cell of soldiers ventured down to a farm to kill a cow for food, they happened across a flyer saying the war had ended August 15th and urging them to come down from the mountains. The remaining cells gathered and discussed it at length. From a mix of isolation and faith in their country, the cells deemed this to be Allied propaganda. They refused to believe that Japan had lost so quickly. If it had not been for the atomic bombs dropped on Japan that successful ended the war, this would have been true. Japan had been willing to sacrifice every last citizen before they witnessed the devastating might of these new weapons. The locals continued being shot at and raided by these Japanese cells and after a few more months were understandably frustrated about it. They persuaded a plane to fly over the jungle and drop leaflets to the cells from Japanese General Yamashita. Again, the cells debated these, and again paranoia won throughout. They believed that the Allied forces were sick of their success in guerilla warfare and were using trickery to get them to surrender. The locals continued to drop these leaflets, and for years, Onoda and his group as well as several others continued to survive in the jungle, skirmishing with the "enemy" and gathering information. Even when the Allied soldiers left the Philippines and everyone started to go about their normal lives, the Japanese soldiers were not persuaded. They let the isolation and hard living of the jungle warp their minds into seeing everyone else as an enemy. Onoda and his group truly believed that the Allied forces had started dressing in civilian clothes to trick them. Even when their own countrymen would drive through the jungles shouting for them on loudspeakers, they assumed they were just Japanese prisoners that were being used to lure them out. After only five short years in the jungle, one of Onoda's own men, Akatsu, decided to surrender. However, he thought it best not to tell the others. In 1949, he slipped away from the group and began his trek through the forest. Unfortunately, it was no simple walk through the forest, it took Akatsu 6 months to find his way out and successfully surrender to what he thought were Allied troops, but in reality were just Filipino army soldiers. After this Onoda and the remaining men became even more cautious as they believed Akatsu to be captured and tortured for information on their whereabouts. Five years after Akatsu left, Shimada was killed in a firefight with the Philippines army on a beach at Gontin. Now only Onoda and Kozuka remained. So they went on together for another 17 years. They were convinced that eventually Japan would send troops to retake the island. To get them through the hard times, they daydreamed about that day and how the two of them would train the reinforcements to be experts in guerilla warfare like themselves. On October 1972, after 27 years of fighting and survival, Kozuka was shot dead by a Filipino patrol. The Japanese had long since thought the pair to be dead; however, after Kozuka's death they believed Onoda may also still be out there alive. They sent search parties, but Onoda was a hide and seek master after 27 years of practice. In 1974, a youthful college student named Nario Suzuki decided to travel the world in an ambitious chase for adventure. He set off to find "a panda, the Abdominal Snowman, and the legendary Onoda." When he arrived in the Philippines, Suzuki set off into the jungle. Where thousands of others had failed, the young student succeeded! He stumbled right into Onoda's jungle hiding spot, and low and behold, Onoda himself. Suzuki tried to persuade Onoda to come home with him, but he refused. Before he was deployed, Major Yoshimi Taniguchi promised he would return and get him, no matter what. So thus Hiroo Onoda refused to leave until his commanding officer came and told him so. Luckily, Yoshimi Taniguchi was still alive, retired and working in a book store. Suzuki cut his trip short and fetched Taniguchi, who travelled to the jungle. In which, Hiroo Onoda officially surrendered. After killing over 30 Filipinos and injuring over 100 other civilians, this surrender and the news that he had fought a non-existent war for most of his life came as a crushing blow to the soldier. Not only had he wasted over 29 years of his precious life but he had hurt innocents for no proper reason. We really lost the war! How could they have been so sloppy? Suddenly everything went black. A storm raged inside me. I felt like a fool for having been so tense and cautious on the way here. Worse than that, what had I been doing for all these years? I eased off the pack that I always carried with me and laid the gun on top of it. Would I really have no more use for this rifle that I had polished and cared for like a baby all these years? Or Kozuka's rifle, which I had hidden in a crevice in the rocks? Had the war really ended thirty years ago? If it had, what had Shimada and Kozuka died for? If what was happening was true, wouldn't it have been better if I had died with them? On March 10th, 1975 at the age of 52, he surrendered his samurai sword to Philippines President Ferdinand Marcos. He did so in full uniform, which he had kept in near pristine condition for 29 years. For anyone that knows how destructive the humidity of the jungle can be to clothing, this is almost as great a feat as surviving in it for 29 years. President Marcos pardoned the soldier of all crimes, upsetting the locals because of all the damage and injuries they had sustained. Hiroo Onoda returned to Japan for the time, but found a completely different country from the one he had left. The whole sense of nationalism was gone, and he felt the nation had lost their once strong pride. Upon return, Onoda was given pay for all his years of service, with this he bought a ranch in Brazil and eventually married. After reading about a teen killing his own parents in Japan in 1980, he returned to Japan to found a school that takes place in various locations around Japan. It teaches young people various survival techniques to help them be more independent and thus better Japanese citizens. Eventually, Onoda returned to the island on which he had spent so much of his life. Even though he donated $10,000 to local schools, he was still not very well liked. I am truly glad I read this through now. I had heard of this man and his condition of denial, but what I didn't know is that he had been ordered to NOT kill himself, and that he had been promised by his C.O. that he would be picked up. That sort of blind allegiance to a country/cause is alien to us, certainly in these modern times (as Onoda learned upon his return). The blind devotion, the denials in the face of certain proof to the contrary, actually makes this man a hero (or an anti-hero, dependent upon which side of the fence one sits) for the Japanese people with memories of its more imperious days. A thumb for the content and subject for sure! Fascinating story, thanks for sharing it. I agree with adragast, this is a fascinating story, I'd heard of such isolated groups of fanatical Japanese soldiers but a focus on a single person really drives the story home. You know I already loved this. Glad to see it on the front page! That is taking "Never give up, never surrender" a bit far. But I do admire the guy's devotion to Japan. What a story. I had read somewhere about Japanese soldiers who refused to surrender not knowing the war had ended but never dug deep into it. This article gave me the real info. Thanks. Wonderful topic & content. Unbelievable that such an intelligent soldier had believed that the WAR was going on for 29 years. In any case, Japan would have either won it (or) lost it by that time.. This is REAL BLIND DEVOTION to the country. A great article... Thumbs Up. Goodness, imagine that . . 17 years with one other soldier (Kozuka). Onoda was incredibly lucky that Yoshimi Taniguchi was still alive. Although it's virtuous to think his behaviour was deep-seated devotion, I almost feel as if some kind of mental illness (re: the paranoia) played a part. Glad he "got out" and married though. 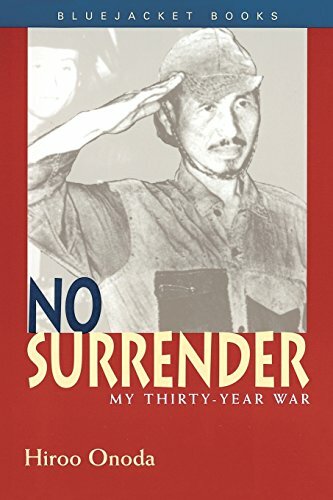 Hiroo Onoda No Surrender: My Thirty-Year War . Tokyo, Japan: Naval Institute Press, 1974.